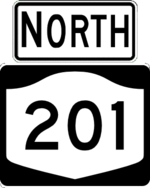 NY 201 is a short freeway on the west side of the Binghamton area connecting NY 434 with NY 17 in Johnson City. 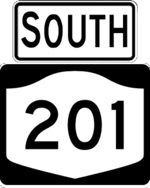 The route consists of the Vestal-Johnson City Arterial (from NY 434 to to Riverside Drive) and an upgrade to Riverside Drive (formerly NY 17H; the remainder of NY 17H outside of Binghamton is now a reference route). In 2004, the traffic circle with Riverside Drive was upgraded to have a through freeway movement for NY 210 and the circle was replaced with a roundabout.